Let's make you a hero. Patient Relationship Management software solutions for all healthcare providers. Practice management systems only go so far in monitoring the patient experience. PRM solutions improve communication and the continuum of care. Practice marketing automation includes healthcare appointment reminders, education and much, much more. Dental providers need tools to facilitate outreach, review management and patient retention. Solutionreach has been a top provider in the dental industry for nearly 17 years. We go way back. Solutionreach is a one-stop shop that takes the place of multiple vendors. Optometrists and ophthalmologists understand the importance of co-management and care adherence. Solutionreach gives providers the tools to manage their patient relationships. The Solutionreach platform increases office efficiency so aesthetic practices can maximize scheduling, retention and patient satisfaction. Solutionreach’s self-scheduling, patient app and other tools enable healthcare providers to make everything a lot easier for their patients. Keep patients engaged in their ongoing care and improve outcomes through targeted newsletters, wellness information and other educational content. Reduce no-shows and increase recall visits with customizable appointment reminders, recall notitications and more. Are you being open to your patients' feedback? Capture survey data to build an exceptional patient experience. Leverage marketing tools such as social media, patient mapping and local search to attract new patients and boost revenue from your current ones. Why leave first impressions up to chance? 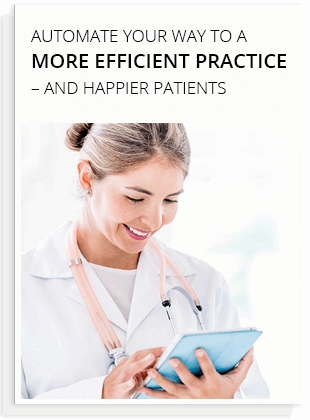 Solutionreach ensures complete online reputation management to maintain a positive overall reputation among your patients. It's time to put an end to no-shows!